With Summer soon to cool off as we head into Autumn, the golden parts of the year are best appreciated in end of day outdoor breezes. Few things beat the relaxation of sitting back in the shade passing an evening in a porch swing. A swing you've made yourself. It’s part rocking chair, part park bench – if your verandah is not wide enough, put it out in the garden in a shady spot on a frame. To have some shade, attach a canvas shade cloth roof. This is similar to the Park Bench for a Garden run earlier in this Summer’s Garden Furniture You Can Make series and as with that item, choosing woods and fittings to suit the environment you’re in will ensure you have a high quality, low maintenance finished item. The Porch Swing is another classic that is still being made and used and when made well will last a few generations and make any nook or veranda into a special place. You can paint it or stain it, adjust the lengths and widths to suit yourself, and have something truly unique that just invites people to spend time enjoying the season outdoors. You will also save yourself thousands of dollars in making this item and once you make one, you may dream up a few alternatives, such as pergola outdoor beds, or adjust lengths and widths and the A-framing to create little freestanding arbours. Although this version, when not part of a verandah, may be moved, this idea is for a permanent piece of garden furniture to highlight a corner of your garden, or turn that same corner into a private peaceful space. If you are going to do the in-garden A-Frame version this project will take two weekends. It will be worth it though! Connections must be secure for safe use of the finished swing. If using the stand alone frame to place in your garden, we recommend cementing the base of poles into the earth to add safety and steadiness. Never let small children play on this swing unattended; they may fall off, or it may swing into them. Use safety precautions when operating power tools and please use proper safety equipment to protect your ears, lungs and eyes when operating power tools or using paints and stains or sanding woods. 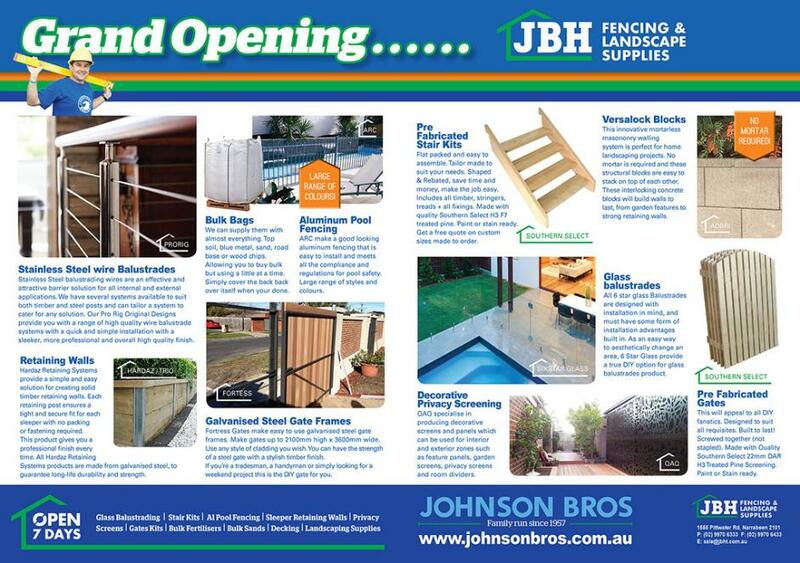 All you will need for this project may be found at the Johnson Brothers stores at Avalon, Narrabeen and Mona Vale and timber can be delivered from the Mona Vale Timber centre. The tools and other items featured are from the current JBH Mitre 10 Get Stuck Into Summer Catalougue, with regular in store specials available at all other times. Coolaroo Shade Sail: $29.00 - Also available Square: $59.00 - • 3.6m. • Up to 90% UV block. • Triangle. • Available in grey or beige. • Includes DTD146Z, DHP458Z, 2 x 4Ah batteries, charger and carry case. • DLX2005M. Makita Li-Ion Circular Saw*: $329.00 - • 190mm. • Takes 2 x 18V batteries. • DHS710Z. * Batteries and chargers sold separately unless specified. Bosch 1800W Slide Compound Mitre Saw: $378.00 - • 254mm(10"). • Built in laser. • Dust collector. Bailey Pro 4 Step Double-Sided Ladder: $220.00 - • 1.2m. • Punchlock aluminium construction. 1. Make sure your ceiling framing is strong enough to support your porch swing. A typical two-person swing can be supported by a single 2 x 8 joist, two 2 x 6 joists, or three 2 x 4 joists, provided all joists are adequately supported at both ends for load-bearing application. Measure the space where you want to install your swing. This area will determine how long your porch swing will be. If the ceiling above your porch has joists, exposed beams, or any other structural elements with cracks running between them, you may want to make the bench a length that will allow you to center the anchors for hanging the swing between the cracks. Also measure the distance behind the swing – allow room for it to swing if you wish to use for more than a gentle rocking motion. If you are installing on an A-Frame in an open garden space, allow 1.2 metre behind and before. For side clearance, allow at least 35 to 37 centimetres on either side of the swing. Decide how deep the seat and how tall the back should be. Measure the seat and back of a similar chair that you feel comfortable in (e.g. a dining chair or a garden bench). The swing built over the course of these instructions is 508 mm (20 in.) deep in the seat and 457 mm (18 in.) tall in the backrest and 1 metre long. This sizing is ranged towards a tall individual and may need to be adjusted for people with shorter legs. 2. Choose the materials you will use for building your swing. 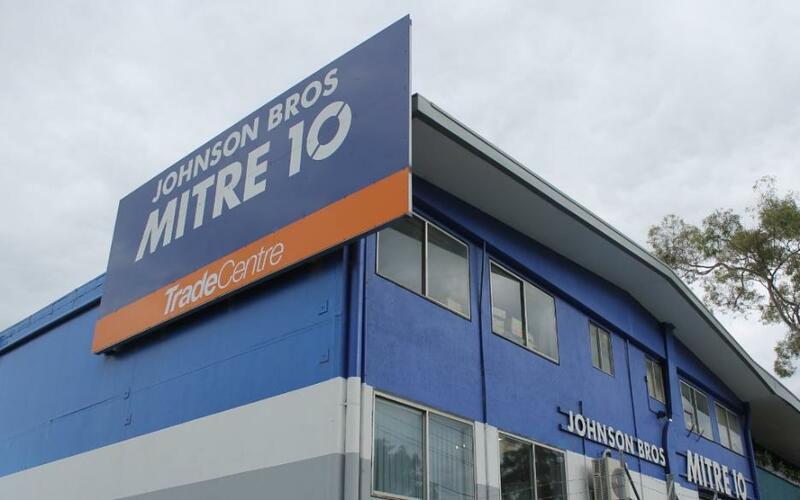 There are now a great range of Australian treated timbers for outdoor use which will not destroy forests, will stop termites and product breakdown – discuss what will suit where you are best and how you want it to look when finished with the trained staff at Johnson Brothers Mitre 10. The sizing suggested here ensure the components are thick and strong enough to support the weight they may carry. 3. Decide how you want the bench to look – do you want just straight across slats or do you want to build in some horizontal slats to contrast with vertical slats. Here's a great idea for something just a little more fancy to look at but not much more difficult! 3. Gather all the tools, fasteners, and timber you need for the project. 1. Measure and cut the slats 50x100 mm (2x4 in.) boards the length you want the finished swing to be (1 metre in this case). Cut these boards to length, being careful to make all cuts square (90 degrees). 2. Cut the boards into slats for the seat and back. The seat slats need to be 19 mm (3/4 in.) wide, while the back slats (which support less weight) only need to be 12.7mm. (1/2 in) wide. For a seat 20 inches (508 mm) deep, you will only need about seat 17 slats (to allow for gaps between slats); for a back 18 inches (457mm) tall, you will only need 15 back slats. The version here uses 24 slats. If your seat or back will be a different size than the one in this example and you aren’t sure how many slats you’ll need, make several slats fewer than the total measurement of the space in inches. Aim on the low side for now; you can always make more later. 4. Drill through each slat, 25.4mm from both ends, with a 4.76 mm (3/16 in.) drill bit. Later, when you attach the slats to the frame with wood screws, these pre-drilled holes will keep the slats from splitting. We recommend also drilling a hole in the dead center of each slat to attach to a center support. If you’re making a short bench and/or working with hardwood, a center support may not be necessary. If in doubt, however, include one, this will ensure a stronger longer lasting piece of furniture. 5. Always sand these smooth when cut and even stain if you want a stained wood finish. This will ensure you apply enough wood-stain/paint prior to the slats being too close together to do this as effectively. 5. Cut 6x (six) 51x152mm (2x6 in.) back and bottom supports. If your bench only needs outer supports, cut two back and two bottom supports; if it also needs a center support, cut three of each. The length of the back pieces should equal the desired height of the bench; the length of the bottom pieces should equal the desired depth of the seat. 6. Draw and cut curves into the back and bottom supports (optional). The bench in this example has gentle curves cut into the bench supports to make the bench more comfortable (and nicer to look at). The amount of curvature depends on your preference, but the seat and back can actually be straight if you prefer. Create a Template to do the curved version; Choose one back support piece, draw the curve freehand with a pencil, then go over it with a marker. Unless the back and bottom supports will be the same length, you will need to do this again with a bottom support piece. If this seems too fiddly stick to just making straight back and base supports and throw a few colourful cushions on your finished item for a touch of panache. 7. Cut a miter at the ends of the back and the seat board. This is so the back and seat boards join at the correct angle for the amount of slant (recline) you want your seat to have. You can start by cutting a 45-degree angle into one of the two pieces, then laying it on top of the opposite piece and twisting it until you get the amount of angle you want. When you’re satisfied, mark the angle onto the uncut piece by tracing along the edge of the top piece you just cut, then cut along the traced line. Trace the cut edge of the back support piece into all the other back supports and cut them to match, then do the same with the bottom supports. The two angles may not be the same. This shouldn't matter since they are on the bottom rear of the swing, out of sight. 1. Attach the back supports to the bottom supports. Drill pilot holes for the screws that will join each pair of supports together, then fasten them with 89 mm (31/2 in. ), 12 gauge Galvanised wood screws. This is a critical connection: since the screws are the only support for this joint, they will have a good bit of pressure in them. Depending on the length of the joint, you might want to insert the two screws at opposing angles. If you wish to add extra bracing with a bracket, do so. This too will add strength and longevity to your piece. 2. Set the completed support-piece pairs on a flat surface and lay the innermost slats across them. Check the supports are spaced evenly and all the back supports are in the same direction, then screw the central slat into place. Unless you don’t mind cutting into the overhang to accommodate the armrests, don’t situate your slats so that they overhang both side supports. The armrests will later attach to the side supports, meaning the overhang will just get in the way. 3. Use a framing square to make sure the support pieces are square with the preliminary slat, then screw on the other slats. Place the square along both the preliminary slat and one of the support pieces and measure whether or not they are square. Repeat with the other support pieces as necessary. If necessary, rack the supports (by shifting them sideways) to make a more perfect 90 degree angle. Space additional slats across the seat, leaving a 6.35 - 9.5mm space between them. It’s a good idea to tack these on temporarily to get your spacing to worked out uniformly prior to attaching them permanently. Attaching the top-most back slat and front-most seat slat first before filling in the others might make it easier to keep your frame square. Take care to use the thicker strips for the seat, and the thinner slat strips for the back. To suit the swing chair sized here the armrest should be about 20cm (8 in) high and 50cm (18-20in) long. 1. Cut two wedge-shaped 50x100 mm (2x4 in.) boards about 33 cm (13 inches) long, tapered from 7mm (2 3/4 inches) on one end to 3/4 inch (19mm) on the other. 2. Cut two more boards 22in (56cm) long, tapered on one end from 1 1/2 inches (3.8cm) to full width in 10 inches (25.4cm) for each armrest itself. 3. Attach the armrests. Locate the height you want the armrest on the back frame, then locate the position you want the support on the seat portion of the frame. Attach these with 7.5cm (3in) 12 gauge wood screws. Fasten through the top of the armrest down into the support board with two more wood screws. 4. Drill a hole through the armrest support and the seat frame for the eyebolt. The eyebolt will attach your swing chain to the swing. Then, drill through the back frame for another eyebolt for the back chain. Screw in the eyebolts, place washers over the backs (to keep the nuts from drawing into the wood frame), and tighten the nuts over the ends with a wrench. Porch and patio roof structures typically include horizontal joists that support the ceiling finish. Joists are often 2 x 6 or larger timber, but they can be as small as 2 x 4. If you have access to your porch structure through the attic, note the joist size and general placement. A 2 x 4 joist is 3-1/2 inches tall; 2 x 6 is 5-1/2 inches; 2 x 8 is 7-1/4 inches. Without attic access, remove a piece of trim in the ceiling or cut a small hole to measure the joist depth. To hang a swing from a single joist or beam, it should be a 2 x 8 joist or 4 x 4 beam. 1. Install short beams (4 x 4's work well) across the tops of multiple joists: Cut two 4 x 4 beams so they’re long enough to span across three or more joists (running perpendicular to the joists). Set each beam on top of the joists so it is centered over one of the swing anchor locations. Fasten the beams to each joist with 3-inch screws driven at an angle through each side of the beam and into the top edge of the joist. 2. Install timber blocking (4 x 4's, 2 x 6's or larger timber) between two adjacent joists, using joist hangers, so the blocking is flush with the bottoms of the joists. 3. Mark the locations for the swing anchors onto one joist, and use a framing square to transfer the marks to the neighbouring joist (blocking runs perpendicular to the joists). Install joist hangers on the inside faces of the joists (the hangers will face each other), as directed by the hanger manufacturer; most are nailed to the joists with special 1 ½-inch hanger nails or screws. Position the hangers so the blocking will be flush with the top of the ceiling finish and centered over the swing anchor locations. 4. Cut two pieces of blocking to fit snugly between the joists, and fit them down into the hangers. Fasten the blocking to the hangers with hanger nails or screws. 1. Drill a pilot hole directly into the center of the joist or beam. Thread in the screw by hand as far as possible, then use a large wrench or pliers to turn the screw until the threads are fully embedded in the timber. You can also insert a tool handle into the eye or hook and use it as a lever to twist the screw. 1. Hanger kits with swivel mounts are designed to mount to a joist or beam running parallel to the length of the swing. Position each mount over the center of the joist or beam, and mark through the predrilled holes for the lag screws. Remove the mount and drill a pilot hole for each screw, using a bit that’s the same size as the screw’s shank (not the threads). Install the mount with 3-inch lag screws, tightening the screws with a socket wrench or impact wrench. These methods are among the simplest and will work for most swing designs. Hanging with chains requires two chains – one long and one short – for each end of the swing. 1. Secure one end of each long chain to the front mounting point of the swing, using an eye bolt. 2. Secure each short chain to the rear of the seat. Connect the short chain to the long chain on each side, about 2 or 3 feet above the seat (this is variable as desired), using small S-hooks or quick links. 3. With a helper or two, hook the long chains onto the hangers in the ceiling (or other support). The short chains pull backward on the long chains, causing the seat to tilt back for comfort. 4. Adjust the tilt and the seat height as desired by hooking onto different links. Swings can hang from a single rope on each side. 1. Bend each rope in half and tie a simple overhand knot, using the doubled-up rope, 5 centimetres from the bend, to create a 5 cm-long loop. Hook each loop over the screw hook in the ceiling (or other support). If you have a screw eye or eye bolt, add an S-hook or quick link between the eye and the rope loop. 2. Prop up the swing on some boxes, check it’s level and at the desired height. 3. Thread the front half of each rope through the front mounting point on the swing and secure it underneath with a basic overhand knot. Make sure the knot is big enough so that it won’t slip through when there’s weight on the swing. 4. Remove the boxes and tie off the rear halves of the rope to the rear mounts on the swing, tilting the swing back at the desired angle. 5. Test the swing and adjust the knots as needed, then trim the excess from the bottom ends of the ropes. Intergrain Ultradeck: $97.90 - Also available 10L: $205.00 - • 4L. • Assorted colours available. Buy the best quality timber you could afford. Most important is that the timber is suitable for outside use and strong enough for the job, which basically means the stock should be reasonably straight-grained and contain very few knots - definitely no big knots. 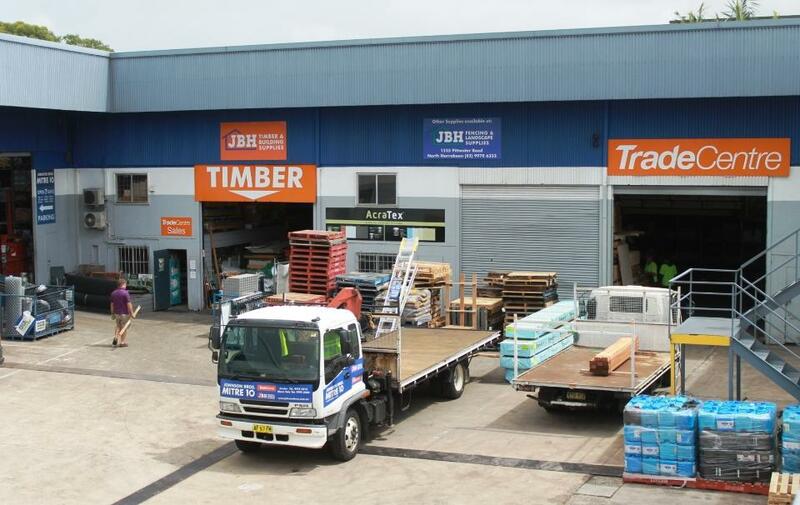 Your local Johnson Brothers Mitre 10 will be able to advise you on the most suitable types of timber available and also what safety precautions might need to be taken while working with any particular type of timber. This support frame is a solid structure purpose made to hold a bench swing but it can have multiple other uses such as supporting a kids' swing set. Building an A-frame garden swing is a simple woodworking project, so any person with basic woodworking skills can get the job done in just a few hours or one day. There are many designs and shapes you could choose from, so we recommend you to study the alternatives before starting the actual construction. Dig holes in the ground and set the posts into concrete, to build a sturdy swing. Plumb the A-frames with a spirit level before fitting the top beam, otherwise the corners won’t be right-angled. Rapid Set Mix: $6.60 - • 20kg. The footprint (ground area) of this bench swing support frame is 2700mm (9ft) x 2100mm (7ft). The overall height is 2025mm (81"). Although this support frame is purpose-made for a particular bench swing, it can also be used to support numerous other utilities such as swings or maybe a glide-ride, and is even capable of accommodating certain types of gym equipment. It is a very solid frame and basically consists of two end A-frames designed to minimize front and back movement, a beam which sits on top and two braces designed to minimize sideways movement. The timber used in this project is 100 by 100 (4x4) stock, which means that the timber is 100 millimetres (4") wide by 100 millimetres (4") thick. This is a very common stock size and should be readily obtainable from most timber or building supply yards. If you prefer to use smooth timber as opposed to rough, that generally means that the wood has been planed or dressed and therefore the size of the timber will be slightly smaller, but that does not matter. 1. The first step of the woodworking project is to build the posts for the A-frame. We recommend you to build the components from 4×4 timber. Cut the ends of the posts at 17º or to any other angle that fits your needs. 2. Make sure you cut a notch inside the top of the posts, otherwise you won’t be able to install the top beam. 3. The next step of the project is to fit the 4×4 braces between the A-frames. Cut the braces at 17º and fit them between the components. Drill pilot holes trough the exterior of the posts and insert 5″ galvanized screws into the braces. Make sure there are no gaps between the joints and add waterproof glue, if you want to get a professional result. 4. Install the posts into the ground. After you assemble the A-frames, we recommend you to set the posts in concrete. In this manner, you will create a rigid structure for the garden swing. Ours were set in 45cm-60cm deep holes in the ground before fitting the A-frames into place.If you don’t want to bury the legs into the ground, you should cut the legs at about 213cm long. However, you should keep in mind that the A-frame swing won’t be as rigid. You can alternatively attach 2×6 beams to the bottom of the legs to create a swing stand. Plumb the frames with a spirit level and secure the frames temporarily with several braces. Pour concrete in the holes, level it with a trowel and let it dry out for several hours. 5. After the concrete has dried out, we recommend you to fit the top beam into place. Make sure the corners are right-angled, before drilling pilot holes trough the top beam and inserting the 15cm wood screws. Drill pilot holes through the top of the legs and insert 6.5 cm (2 1/2in) screws into the top beam. Place a spirit level on top of the beam, to check it is perfectly horizontal. 6. The last step of this garden project is to fit the top braces, in order to add support to the wooden construction. Cut both ends of the 4×4 supports at 45º and align it at both ends. Afterwards, drill pilot holes and insert several 9cm galvanized screws. Add waterproof glue to the joints, in order to increase the rigidity of the structure. The A-frame swing has a nice appearance and a rustic look. If you choose the right location, this swing will enhance the look of your property. Mirabella Lantern: $15.00 - • Solar. • Pack of 4. • Round.